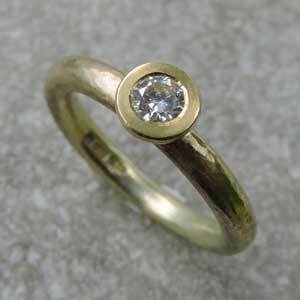 This 4mm Diamond is set in a solid gold pillow, on an 3mm ‘Affinity’ style ring and is available in 9ct & 18ct gold. Diamond is of GH/SI quality, clear, bright and conflict free. Our engagement rings are handmade to order. Allow at least 4 - 6 weeks when ordering Gold Rings. The time scale somewhat depends on how much work we have on at the time. If you want your ring quickly, or for a particular date, please let us know and we will try our best.